Hey everyone! Okay...so it´s only March and this has been the hottest week I´ve ever experienced in my life. It is super hot. I also received my 5th marriage proposal from a drunk Mexican this week....I´m not sure how I´m even suppose to respond to that... ¨umm thanks....here take this phamplet about Jesus..¨ haha! I love the people here! And not just because the drunk men try to flatter my companion and I! haha! Theyre actually some of the most loving people I´ve ever met. They´re loyal and they´re passionate about everything. This is the first time in my 4 months here that I´ve actually showered without a bucket of cold water and a little cup. I love showerheads. I also love houses without cockroaches and ants...but that´s a completely different story. Let me just tell all of you that I am definitely not in the states. I don´t know if I told you guys, but we had transfers and I´m training a girl from San Diego and from everything she´s told me it´s a super legit place and I totally want to go one of these days. She´s super awesome and we get along great! I love being her companion. We have a great time and I´m trying to teach her all the Spanish I know, but it´s super hard because this is the first time in 4 months that I´ve actually been with someone that speaks English and it´s just so much easier to communicate in English...some may call me lazy, but I think it´s alright. We´re trying this new thing were we speak English in the house and Spanish when were outside (basically for our protection..) but sometimes we just speak in English, haha! We have a few baptisms that are planned for April 19th and we´ll see if when the time comes the people still want to join the church. 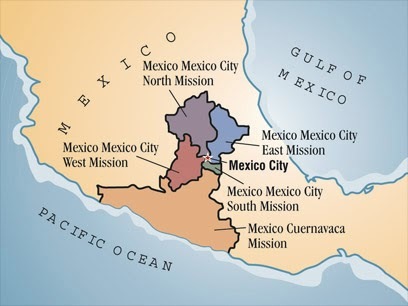 I¨m actually really glad I was born into the church and could investigate it afterwards, already having the influence because I´m not sure where I would be right now if I wasn´t associated with the church from a young age...I can sure tell you I wouldn´t be in Mexico! That´s for sure! One of the men we´re teaching right now is actually a pretty special case. He had an accident a few years back and completely forgot everything...he had to start from scratch and it´s really awesome getting to know him because he´s quiet the character. Two days ago there was a street protest of teachers in the state of Guerrero and we couldnt get a combi ( the bus- mini van transportation) for the life of us. The streets were literally congested for hours! I cannot wait until General Conference! I also want to congratulate my friend Brittany and her new fiance Matt on their engagement! Congrats!! This week we traveled the Cuernavaca again to help my companion out with her visa. On the way there the police stopped the bus and asked to see everyone´s ID! Ha! My companion was all panicky but I whipped out my ID and I just told the police that she was with me...haha! Talk about feeling legit! Oh and before we got on the bus there was this bag checker guy who´s suppose to check the bags to make sure we´re not bringing anything dangerous on board and he totally didn't ask me to check my bag..it was pretty funny though because I asked him if he wanted to look at what I was carrying and he replied "oh yea..of course," ....do your job! haha! Last week a miracle happened...after our district meeting my companion went over to talk to one of the leaders because she had a question about something and 20 minutes later she comes over and gives me a huge hug! Something that´s never happened before...lol..later in the house she told me what she and the leader had talked about and apparently they had a heart to heart and she totally apologized for not talking to me and for being rude to me! I was astonished. And from this point we've been on good terms...it´s crazy what can happen here in the mission. I still can´t believe I've been here for 4 months! I´m looking more and more Mexican everyday! I love you all! Hey everyone! This week has been interesting that´s for sure! I´m pretty sure every week in Mexico is interesting haha. Today I scored 2 goals in soccer when we were playing with the zone, I´m pretty sure some of the Elders let the ball slip by, but I wasnt going to say anything haha! I don´t know if I mentioned this in my last letter but I´m really uping my homemaking skills ;D The bishops wife taught me how to crochet and I´m currently in the process of crocheting a tie...no judgement. Congrats to my brother who got accepted into BYU! We can finally do all those plans we had planned before I left for Mexico! Best friends Kris...we´re going to be best friends... ;D lol in the least creepiest way possible. So I bought UNO for my companion and I to have some bonding time together lol I spent 8 bucks on those cards so I hope it´s worth it! It´s still super hot and I have some killer tan lines that I´ll definitely be bringing back as a soverign. We´re teaching a couple that wants to get baptized but the catch is that theyre not married...I hope we can work it all out and help them get married! They´re young and super great. I´m also reading ¨Jesus the Christ¨ which was a recommendation from my dad and I LOVE it...there are so many things that I´m learning that I never knew before. I would highly recommend it to anyone that wants an excellent read.